Last Tuesday, my class and I were invited by our professor, Nancy Carrick, along with various other students studying drama at the University of Redlands to a matinee performance of Iphigenia in Aulis—a Greek play written by Euripides, first performed in 405 B.C.—which we attended at the Barbara and Lawrence Fleischman Theater at the Getty Villa. The play tells the story of Agamemnon who had a choice to make: sacrifice his daughter, Iphigenia, to win the war against Troy, or save her and leave the Greeks to fall to ruin. The actors were a part of the Court Theatre from the University of Chicago, and they did a tremendous job portraying the tragedy and grief of the characters in this tale. 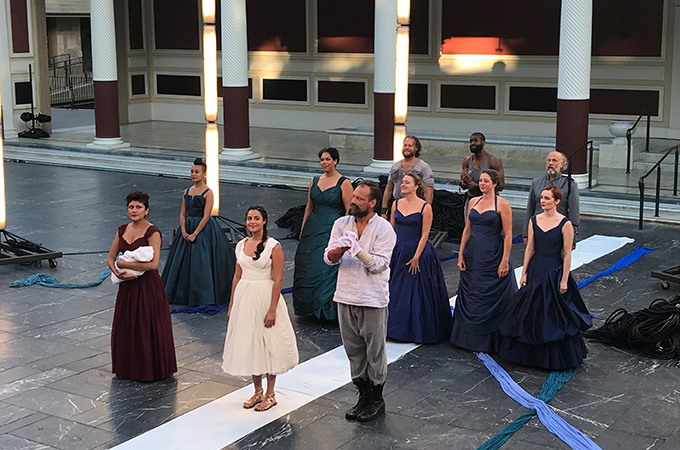 Sandra Marquez, who portrayed Iphigenia’s mother Clytemnestra, brought me to tears with her monologue to her husband Agamemnon begging him to spare their daughter’s life. For class, we had read a different translation, titled Iphigenia at Aulis—a small change, but the differences were evident, especially at the end of the play. The performers took a less-Greek approach by finishing the scene with the cast still on stage, whereas traditionally the last ones left are the Chorus. To me, it seemed this added a more modern twist to a classic. And I think that was something the troupe wanted to get across. Following the performance, much to our delight, the actors returned to answer questions from the audience, joined by a few of the production’s company members. It was great to be given a chance to talk to the actors and learn, from their perspective, what they thought about the play and the chance to perform it. Stephanie Andrea Barron, the actress playing Iphigenia, touched on what it is like performing a play from so long ago. We were also given a chance to visit the J. Paul Getty Museum following the Q&A. It was almost surreal, because the museum was used as a backdrop for the play, so as an audience we were able to invade the stage. We were lucky to be able to view the newly renovated second floor which was chock-full of Roman and Egyptian art. A few of my favorites were the huge tile mosaics of hunting that stretched over six feet across walls and floors, and a green-rusted bronze statue of an infant Bacchus, the Roman god of wine, standing tall, an ivy-leaf wreath of grapes tilted over his head.